Thank you all of you who privileged us with your attendance at the recent BIG 5 Construct East Africa event and contributed to its great success. GLASSCON’s participation at this first ever construction event held at the Kenyatta International Conference Centre in Nairobi Kenya from 2nd to 4th of November 2016, had an overwhelming turnout. Our regional agents teamed up with our European experts to strengthen our presence on this event. According to the event organizer, over 6000 professionals visited the show and had a chance to witness our solutions first hand and get an idea of what we can deliver. GLASSCON unveiled its latest facade engineering and consulting services and received positive feedback among the attendees. We completely redesigned our services to be applicable to the emerging East Africa region. Our pre-tender and post-tender facade engineering services, as well as our building rehabilitation solutions paired well with the East African market needs. We welcomed over 500 visitors of all kinds (developers, architects, engineers and fabricators) and had on spot discussions regarding their project queries and needs. “We are really impressed to see so many people stopping at our booth on the three days event of The Big 5 Construct East Africa. The turnout was really fantastic and we definitely plan to come back next year!” GLASSCON’s Area Sales Manager noted. “We are here to provide European expertise and support local industry companies to realize their planned projects, which most of them are quite high-end and complex. We are fascinated how local professionals embraced our ideas and are willing to work with us to design and build better building envelopes. We believe premium quality should not be negotiable in emerging economies.” GLASSCON’s Country Manager concluded. 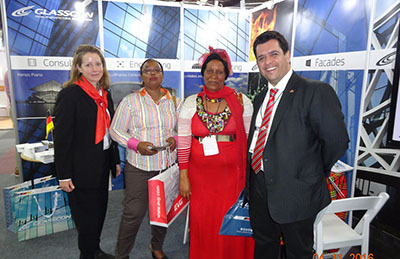 It has been wonderful exhibiting at The Big 5 East Africa and we will definitely see you again next year.